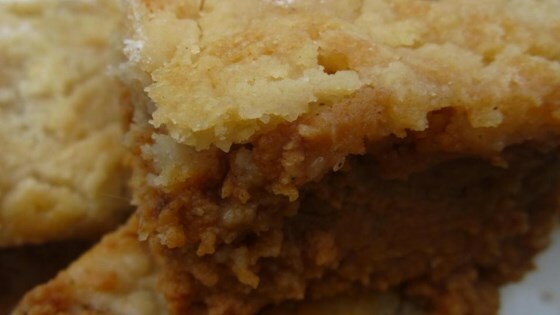 "These pumpkin pie bars taste like pumpkin pie, but are so much easier because you don't need to bother with the pie crust. The yellow cake mix does all the work." Beat eggs in a large bowl. Whisk sugar, cinnamon, salt, ginger, and cloves together in a separate bowl. Stir sugar mixture and pumpkin into eggs until completely incorporated. Gradually stir evaporated milk into pumpkin mixture. Add 1 cup yellow cake mix to the pumpkin mixture and stir to remove any lumps. Pour mixture into a 9x13-inch baking dish. Sprinkle remaining yellow cake mix over the top and drizzle butter over the cake mix. Bake in the preheated oven until set, about 1 hour. Cool to room temperature and cut into bars. Top with whipped topping. Pumpkin pie? In a milkshake?! Yes please! This recipe is easy and tastes great! I substituted 1 cup gluten free cake mix, and left off the topping, so it was even more like pumpkin pie AND gluten free. Yay!